Fruit Crisp are simple and quick to prepare. 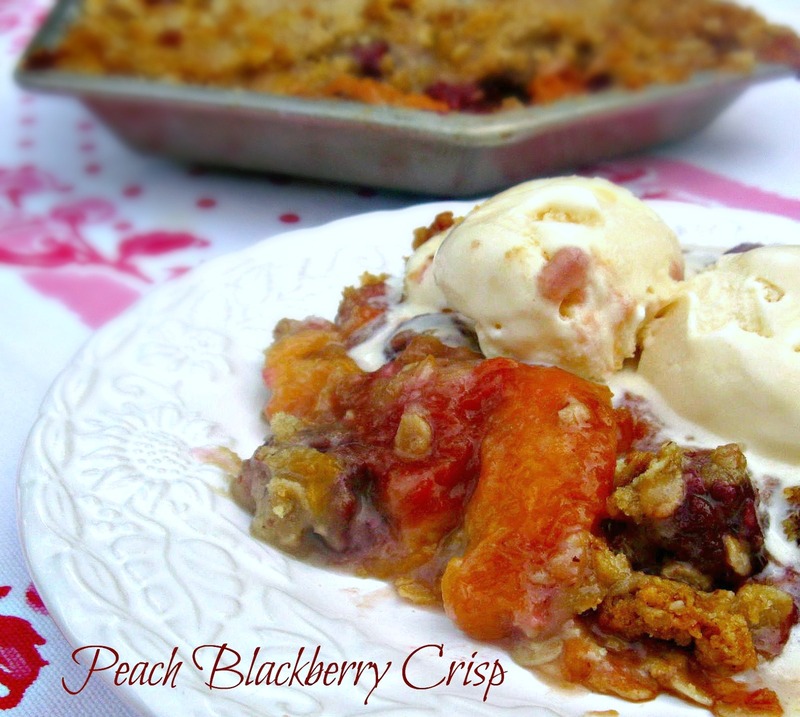 Here is a great link giving you the differences between Crisp, Cobblers, Crumbles, and other fruit desserts. You can use most any fruit to create a scrumptious dessert using relatively few ingredients and even substitute sugars and flours to make them healthier. 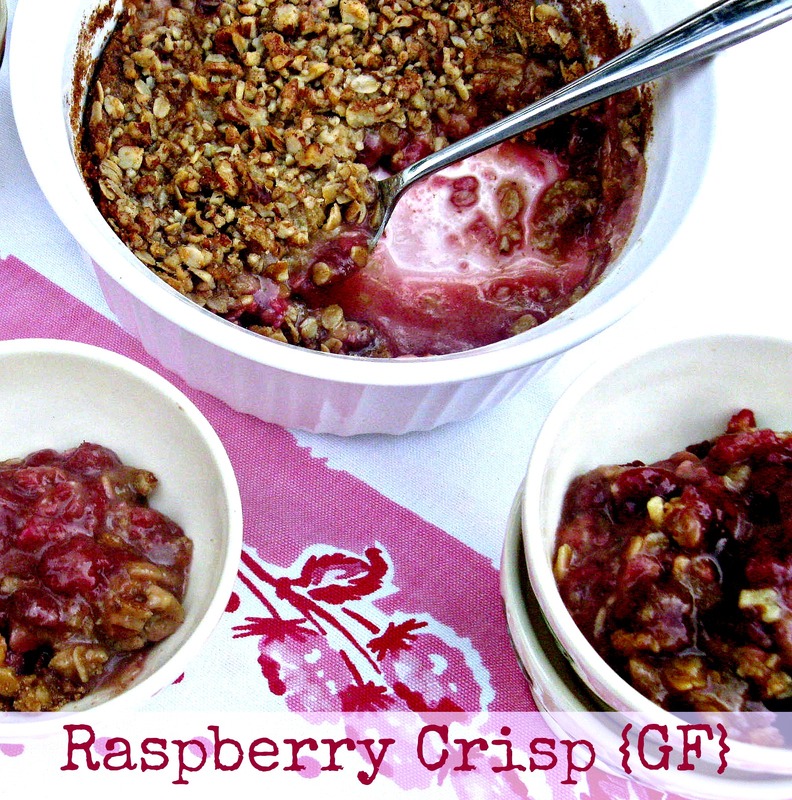 For the Raspberry Crisp, I used a gluten free baking mix and added chopped nuts for additional deliciousness. One of the reason I made these three Fruit Crisp is I had fresh raspberries, blueberries, and blackberries sitting in the refrigerator that were needing to be eaten. Actually, that is how fruit crisp came about. English settlers in America made the dish as a way of using up seasonal fruit. I thought about making smoothies, and then I thought about making a cobbler using all of them together, but I really had my mind on making a crisp. I had a small package of sliced peaches in the freezer that was too small to make a cobbler with, so I decided to combine them with the blackberries and make a Peach Blackberry Crisp. 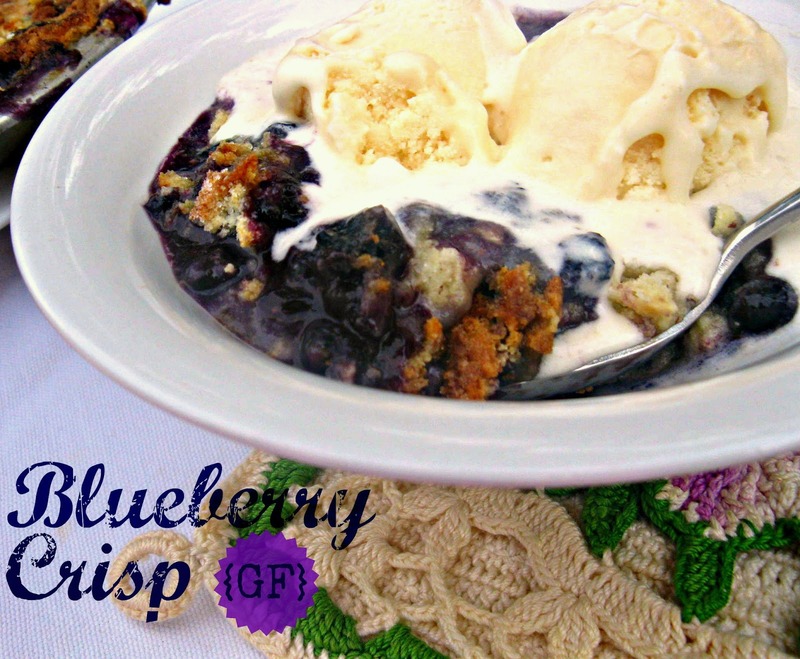 A fabulous dessert for any occasion is one that you can add a scoop or two of vanilla ice cream, and that is just what we did with this wonderfully delicious Blueberry Crisp. The sweetness of the berries and the crunch of the topping, you would never know that this crisp is gluten free. All three of these fruit crisp are made with the same recipe, but with different options. Not only are they easy and quick to make, you can easily freeze them for a handy dessert to grab and pop in the oven when you need one. Spray a medium size dish with a non stick cooking spray; set aside. In a medium bowl, mix cornstarch and sugar. Add fruit and vanilla tossing together being sure not to mash the fruit but coating them well. Pour fruit mixture in the prepared dish; set aside. In a small bowl, mix together flour, oats, and sugar. Using a fork or a pastry blender, cut butter in the flour mixture until pea size crumbs are formed. Stir in nuts and sprinkle over fruit mixture. Take out of the oven and cool slightly before serving. Note: Berries cook faster than solid fruit such as peaches and apples, so allow for longer cooking time. Oh what lovely desserts - I thought I knew all the possible combinations of crisps - but the peach raspberry is a new one to me - and how delicious! I LOOOOVE fruit crisps - love all these great ideas. I just bought some fresh raspberries yesterday and think maybe I'll whip something special (& healthy) up for us to enjoy after dinner tonight. Thanks for sharing - your photos look terrific! Mmm all your fruit crisps look delicious!!!!! I love baking different kinds of these, with some ice-cream they are my favorite summertime dessert! These all look wonderful, I love the fruit and nuts together! What a great collection of Classic Crisp, I would have one of each please. Hope you are having a great week and thank you so much for sharing with Full Plate Thursday. I always have tons of raspberries in the summer. I'm going to try this out this year. Thanks so much for sharing at Terrific Tuesdays. These look delicious! I love making fruit crisps. Thanks so much for stopping by Creative Thursday this week. I couldn’t do these parties without you. Can’t wait to see what you link up next week. Have a wonderful weekend. I love crisps. Especially the topping. I've never thought about a raspberry crisp though and will definitely have to try one. Each on of these crisps look SO good!! I've never made a crisp but you certainly show how simple and tasty they can be! Thanks for sharing! So yummy! I can't wait to try ALL THREE recipes! Thanks so much for sharing at Mom On Timeout! I love a good crumble! What a great recipe!